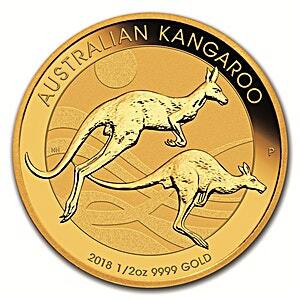 For 2018, the obverse of the 1/2 oz gold Kangaroo features a stylised design of two Kangaroos bouding across an Australian rural landscape. The imagery is inscribed at the top by the words 'AUSTRALIAN KANGAROO', and includes a ‘P’ mint mark signifying Perth. The obverse also displays the coin's year '2018', weight '0.5 oz', and the coin's purity '9999 GOLD' .